Fonts are one of the key element in both traditional designing and Web Designing. We have explained the resource and types of according to License of Fonts. We have discussed about Typography, various types of Fonts, their usage, different guides on using Fonts through various articles. In this article, we will discuss about some resources of Fonts and most importantly – their License for usage. http://www.whatfontis.com/ http://www.dafont.com/ http://www.fontsquirrel.com/ http://losttype.com/ http://www.cufonfonts.com/ http://www.fontcab.com/ http://www.letterheadfonts.com/ http://www.urbanfonts.com/ http://openfontlibrary.org/ http://www.fontdiner.com/ http://www.searchfreefonts.com/ http://www.1001fonts.com/ http://www.fontbros.com/ http://www.iconian.com/ http://www.myfonts.com/ http://fontstruct.com/ http://www.fontspace.com/ http://www.fontshop.com/ http://fontfabric.com/ http://fontdeck.com/ http://www.fontspring.com/ http://fontsinuse.com/ http://www.abstractfonts.com/ http://www.philsfonts.com/ http://iginomarini.com/fell/ http://jeffreyschreiber.nl/ http://html.adobe.com/edge/webfonts/ http://www.typedepot.com/fonts http://www.google.com/webfonts https://typekit.com/? So, Free Font, technically is the best option as we can use them for Free and has the Freedom. Unfortunately, not all good looking fonts has equivalent Free option. Proxima Nova, for example is a great looking premium font. But there is free Font closer at look to Proxima Nova. One must weigh the need and search for alternative free option not only for saving the money, but also for the degree of freedom of usage. A typical font may contain hundreds or even thousands of glyphs, often representing characters from many different languages. Oftentimes, users may only need a small subset of the glyphs that are available to them. Subsetting is the process of removing unnecessary glyphs from a font file, usually with the goal of reducing file size. This is particularly important for web fonts, since reducing file size often means reducing page load time. This Article Has Been Shared 7114 Times! DHCP or Dynamic Host Configuration Protocol assigns network configuration automatically without manual configuration to allow the clients to connect a server. Sentence Case Converter tools are automated tools to convert text to upper case, lower case, sentence cases.Useful for converting all caps texts to normal text. AES or Advanced Encryption Standard is a symmetric cryptography and taken as standard by National Institute of Standards and Technology (NIST) for encryption. 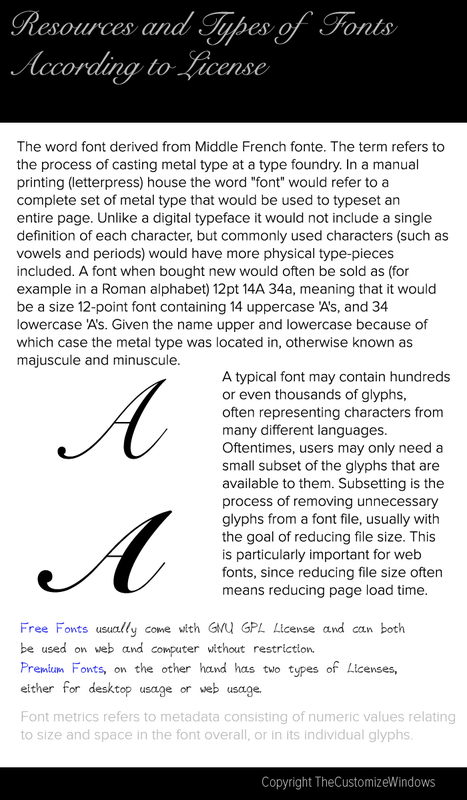 Cite this article as: Abhishek Ghosh, "Fonts : Resources and Types of According to License," in The Customize Windows, March 5, 2014, April 20, 2019, https://thecustomizewindows.com/2014/03/fonts-resources-types-of-according-to-license/.